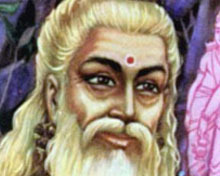 A number of Sanskrit epics like Aitareya Brahmana (800 BCE) refers to the Vedic roots of the Telugu speaking people of Andhra in the Indian subcontinent. During the period from 700 to 300 BCE, an ancient kingdom called Assaka Maha Janapada (great empires) was in the saddle between Godavari and Krishna rivers in south-eastern India. There are many anecdotes in Ramayana, Mahabharata and other puranas that point to the people being the descendants of Sage Vishwamitra. One of the 16 majestic kingdoms in 600 BCE, the Assaka was replaced by Satavahana empire (230 BCE - 220 CE) whose rulers built the ancient township of Amaravati and they reached to new heights under the rule of King Satakarni. The exit of Satavahanas led to many divisions in the vast Telugu landscape which was ruled by a number of feudal chieftains and small kings. 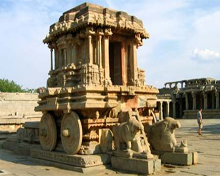 While the Ikshvakus ruled the eastern Andhra along the Krishna river in the second half of 2nd Century, the Pallavas (4th Century) emerged as a big force with an empire stretching from southern Andhra to northern Tamil Nadu with Kancheepuram as their capital. The Pallava kings Mahendravarman I (571 - 630 CE) and Narasimhavarman I (630 - 668 CE) had established a firm control over southern Andhra and northern parts of TN till the end of 9th Century. It was left to Kakatiya dynasty to unify all Telugu lands during their reign between 624 and 1323 CE ushering in a great synthesis of social, cultural, religious and literary elements of Andhra people who for the first time were governed under a single administration. Telugu language and its literature replaced the once dominant Sanskrit (and its dialect Prakrit), thus contributing to the nurturing of Telugu pride among the people. Most notable writer was Nannaya whose literary works made good impact on the society. 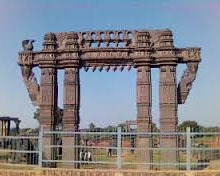 The Chalukya Chola dynasty (later days Cholas) ruled a vast swath of territory from the island of Lanka to Kalinga in the northeast from 1070 until the demise of their empire in the second half of the 13th century. General Ulugh Khan commanding a large army was sent by Delhi's Sultan Ghiyath al-Din Tughluq to conquer Telugu kingdom of Kakatiya in 1323. Later on, this very same Ulugh Khan ruled Delhi as Sultan Mohammad bin Tughluq after laying siege to Warangal. A new era of power struggle erupted after the fall of Kakatiya dynasty with Turkish kingdoms in Delhi, Chalukya Cholas in the south and the Sultanate of Central India (Persio-Tajik) competing with each other to extend their influence in Telugu heartland. Musunuri Nayaks defeated Delhi Sultanate in battles thus paving way for another glorious chapter of independent rule under the Vijayanagara Empire (1336-1646) for the Andhra people. King Krishnadevaraya emerged as the tallest emperor in South India by extending his control over deep South, building temples, monuments and patronising fine arts. After Musunuri Nayaks defeated the Delhi Sultanate in battles, they were driven off back to Delhi. Soon a neutral Muslim state called Bahmani Sultanate was formed in Central India by Ala-ud-Din Bahman Shah after revolting against the Turkish kingdom in North India. But the unexpected demise of Vijayanagara empire led to the emergence of a more liberal Qutb Shahi dynasty at the Bahmani Sultanate that ruled most of the current state of Andhra Pradesh. They promoted a Telugu way of life by encouraging literature and fine arts for about 200 years (early 1500 to 1699). With the European powers eyeing territories for trade and exploitation, the Qutb Shah dynasty at the Bahmani Sultanate came to an abrupt end. The French under Marquis de Bussy-Castelnau and the English army led by General Robert Clive were busy planning strategies to take over the fertile and rich Andhra land. In 1765, Lord Robert Clive with the help of his council in Vishakapatnam got from the Mughal emperor Shah Alam a grant of the five Circars (known as Northern Circars of British India's Madras province). But in a battle, the British defeated Maharaja Vijaya Rama Gajapati Raju of Vizianagaram in 1792, thus extending full control over Andhra region. Freedom struggle laid the foundation for the birth of a unified Andhra state after Independence. 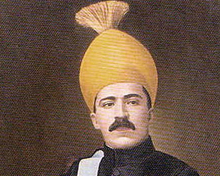 After Independence, the Muslim Nizam of Hyderabad wanted to retain his sovereignty, but was forced to cede his kingdom to India in 1948 to form Hyderabad state which remained separately from Andhra region which was part of the then Madras Presidency. The fiery campaign of Potti Sriramulu (1901-1952) who died fasting for an independent state for Telugu people carved out of the then Madras Presidency led to violence in many parts of Andhra. Social reformers like Tanguturi Prakasam Panthulu and Kandukuri Veeresalingam further led the agitation for a new Andhra state which was formed on 1 October, 1953 with Kurnool as its capital. Prakasam Panthulu was the first CM of Andhra. Andhra State was the first state in India to be formed on a mainly linguistic basis by carving it out from the Madras Presidency in 1953. Andhra state was later merged with the Telugu-speaking area of Hyderabad state to create Andhra Pradesh in 1 November, 1956 following a report submitted by States Reorganisation Commission (SRC). The SRC report offered special safeguards to Telangana as part of Gentleman's Agreement. Two-party system with a democratic governance emerged as Telugu Desam founder and CM N.T. Rama Rao ruling the state with Congress in the opposition during the 1980s. The movement for separate Telangana gathered speed in early 2000s with violent protests, bandhs and campaigns resulting in many deaths and loss to the exchequer. Bowing to the wishes of the people, the Centre passed a new legislation in Parliament for the creation of Telangana with 10 districts on 18 February 2014.